One of the most important lessons Alyssa Umberger ’17 has learned about her chosen career field is that there are two completely different aspects of environmental science work. Sometimes environmental scientists spend extensive time outdoors, tracking air pollution and water quality. Other times, scientists sit at a desk writing permits and analyzing data. Thanks to her recent internship experiences, she’s confident she will be prepared for any job in the field. 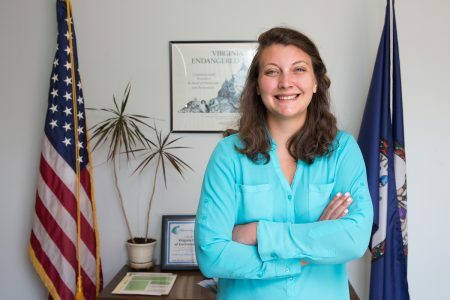 Last summer Umberger shadowed a field agent for the Dauphin County Conservation District in Pennsylvania, and this spring she wrote water permits for municipal and industrial plants as an intern for the Virginia Department of Environmental Quality’s Lynchburg office. Umberger was prepared for her internships thanks to the variety of classes she had taken at Randolph. As an environmental science major, she took a wide range of her favorite science-themed courses in biology, chemistry, physics, and math as well as classes on environmental policy. Umberger’s supervisor, Frank Bowman, was impressed with Umberger’s broad knowledge and grasp of the complex tasks the job entailed. Further diversifying Umberger’s portfolio is her second major in French. She began studying the language in high school and decided to keep it up as her “fun class” in college. She was able to apply her skills from that major in a practical setting as well, by studying abroad at the Université Catholique de l’Ouest in Angers, France in 2015. Her experiences have taught her that making connections with other professionals is key in any field.